What Is the Best Way to Ship a Painting in the USA? Most artists and gallery owners find shipping a painting one of the most challenging steps of selling art, especially when it needs to be transported long distance or overseas. 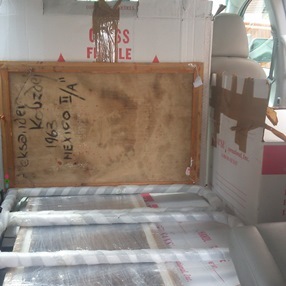 Hence the question arises: how to ship a painting properly so that it stays intact in transit? Well, when it comes to the best way of shipping artwork in the USA, it is always better to entrust this job to a professional fine art shipping company! At Fine Art Shippers, we have been moving and shipping artwork for more than 20 years, and we know exactly how to ship a painting safely to literally any destination. Our trained team of art handlers is proficient in everything related to packing and shipping a painting of any medium, size, and weight. Moreover, we pay special attention to every single step of the transportation process to ensure that there is no chance of the item’s damage in transit. So if you need to ship a painting, just let us know about that! Our team will come to your place at any time, soft pack and wrap your artwork carefully in order to deliver it safely to our warehouse, build a custom wooden crate for it, and finally ship it to wherever it needs to be in the world. The whole process is done as quickly as possible, often within a single day. After all, Fine Art Shippers is known for professional same-day fine art delivery services provided within the Tri-State Area and a variety of cost-effective and secure long-distance shipping solutions to meet the needs of those who are looking for the best way to ship a painting in the USA. However, while to hire a trustworthy fine art shipping company is always the right decision, you can certainly pack and ship a painting yourself. In such a case, do not miss the following tips! Use a double-wall corrugated box that is several inches larger than the dimensions of your artwork. If you are shipping an oil painting, wrap the canvas with acid-free paper to protect it from dust and moisture. Make sure the frame and the corners of the painting are also properly protected. After you have placed the wrapped artwork into the box, fill in the gaps with bubble wrap or another cushioning material. Carefully seal and label your package with the necessary shipping labels. If you are not sure you can ship a painting yourself, contact Fine Art Shippers without hesitation! We will get this job done for you in the safest and most cost-effective way possible!